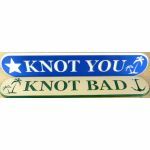 We produce custom engraved name boards, fabricated from your choice of nominal 1” thick First European Quality (FEQ) teak or ½” or ¾” thick King Starboard Color-Core, a high-tech marine plastic that incorporates built-in color combinations that are virtually maintenance-free. We’ll work with you to find the type font that suits your fancy. And we’ll incorporate engraved line art as well, using either the artwork you supply or engraved are that we develop for you. You’ll receive computer-generated line art drawings of your name boards for your approval before we put them into production, so you can be sure that every aspect of your name board design is just as you want it. 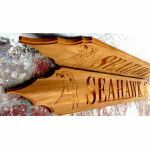 That said, we also offer economical stock name board designs in both solid FEQ ½” thick teak and ½” thick King Starboard Color Core -- complete with your choice of several graphic stock-art designs, all precisely engraved on our CNC machine. These stock-design name boards all share a common type font and name board profile, and most are a standard height and length. However, our stock-design name boards can also be lengthened to accommodate longer than usual vessel names for a modest additional cost. 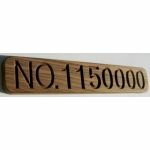 Our documentation boards are built to standard size specifications, with letters and numerals sized to conform to U.S. Coast Guard regulations. These modestly priced boards are available in your choice of ½” thick FEQ teak, ½” thick King Starboard Color Core, and ½” white PVC.